Christmas is fast approaching and that means it's time for the big guy to come down our chimneys and eat up all of our cookies. Whether or not you believe in good ol' St. Nicholas, here's your chance to look like him! 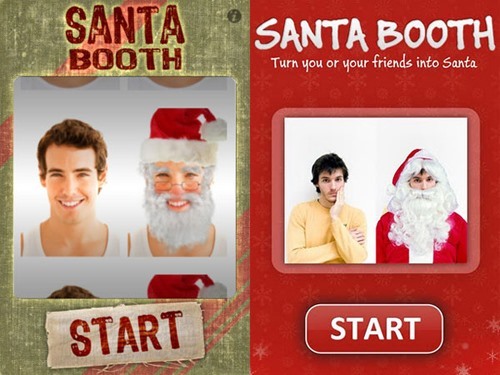 Santa Booth is an app available in the App Store as well as the Android Market. Though both apps hold the same name, they are made by two different developers. Santa Booth by PocketApp can be found in the Android Market. Santification is easy. Align yourself with the frame, snap a picture, then your Santa-fied photo is ready in the gallery for your enjoyment. The version made by Analog Nest for the iOS has a few extra features. It gives users a plumpened up face, bags under the eyes, a rounder nose, and rosy cheeks. To top that off, you are given a hat, Santa brows and a beard. Other characters that you can transform yourself into are Mrs. Claus, an elf, or a reindeer. If you decide to try out either of these apps, we'd love to see your photo as Santa Claus on the Phone Snap corkboard. What are you waiting for? Go Santa-fy yourself!